His full name is William Arnold Ridley and was born Bath, he was educated at Beechen Cliff School and graduated from the University of Bristol. He served in the First World War suffering several serious injuries. His left arm was left virtually useless, due to an injury he got whilst on the Somme. His legs suffered a lot of shrapnel, and he was prone to blackouts due to a head injury he acquired from a German soldiers rifle. He was a major in the Second World War. After the war, he went into writing and is most famous for the play The Ghost Train (1923). It was later made into a film starring Arthur Askey. In the 60's he appeared in the radio programme The Archers as Doughy Hood. He was awarded the OBE in 1982 for services to theatre. Arnold was married to actress Althea Parker, who died in 2001. His full name is Arthur Ian Lavender and was born in Birmingham. He went straight from school to the Bristol Old Vic Drama School. After graduating he appeared on stage in the play Canterbury. Not long afterwards was his first TV role, the lead part in an ATV play called Flowers At My Feet. Shortly afterwards, he got the part of Frank "Stupid Boy" Pike in Dad's Army. He has been in numerous theatrical productions, most notably The Merchant Of Venice, with Dustin Hoffman. In the 70's he appeared in various films including Carry On Behind (1975). He was reunited with Dad's Army creator David Croft in 1978, for the unsuccessful Come Back Mrs Noah. From the 90's onwards he has featured in many TV shows including Cluedo, Yes Minister, Goodnight Sweetheart and 4 years in the soap Eastenders. He successfully managed to fight off cancer of the bladder in the 80's, and had to cut down on his workload after a mild heart attack in 2004. He has recently been in BBC TV's Casualty, and has toured with the Rocky Horror Show. Born in Amersham, Buckinghamshire, his full name is William Desmond Anthony Pertwee. He is a distant cousin of Doctor Who actor Jon Pertwee. As a young man he was a member of the Air Training Corps (UK Air Cadets). His first major project was in 1959, when he starred alongside Kenneth Horne, Kenneth Williams, Betty Marsden and Hugh Paddick in the radio series Beyond Our Ken and later Round The Horne. On radio he also appeared as his Dad's Army character Hodges in the sequel It Sticks Out Half A Mile. Films he has appeared in include 3 Carry On films, Loving, Girls and At Your Convenience. The latter, Bill's part ended up on the cutting room floor. He appeared in the very last episode of Perry and Croft's It Ain't Half Hot Mum as the Demob Centre Supervisor and also went on to have a major role in You Rang M'Lord? as Police Constable Wilson. Bill is President of the Dad's Army Appreciation Society and has written a book about the show "The Making Of A Television Legend". He is the godfather of one of co-star Ian Lavender's sons. He has recently published his updated autobiography "A Funny Way To Make A Living". His wife only recently died. He was awarded the MBE in 2007, and lives in Surrey. Frank was born in London and got his first taste of acting whilst at a North London grammar school. In 1951 Frank joined London's Gateway Theatre as a student ASM. which enabled him to take on small roles whilst there. His first break in Television was in 1952 in The Call Up, a drama concerning conscripts going through National Service training. His first film was in 1956 in The Extra Day. It was the TV series The Army Game that brought Frank's name to the fore. Having first appeared in a small part in the series, he went on to play the character Captain Pocket in some 70 episodes. He first forged a friendship with Jimmy Perry in 1957 at the Palace Theatre, Watford which was run by Jimmy and his wife Gilda. It was there that he had 2 of his own plays produced. This was to reap big benefits over a decade later when Jimmy and David Croft were recruiting actors for Dad's Army. He has been consistent in his theatre roles over the years, appearing in plays such as A Midsummer Nights Dream. His film career has included starring alongside Norman Wisdom in a couple of his films. His TV roles are many, including Emergency Ward 10, z Cars, Adam Adamant Lives!, Monty Pythons Flying Circus, The Rock Follies, House Of Cards and , of course Perry and Croft's You Rang M'Lord? Frank is also Vice-President of the Dad's Army Appreciation Society. Born in Oldham, near Manchester. His father was a stage actor who died when Edward was only 14 years old. His mother couldn't afford drama school, so he decided to pursue a career in acting on an amateur basis. He joined a local company called the St Luke's Players. In 1937 he joined the Teddington Theatre Club where he gained experience in producing and staging as well as acting. During the Second World War he joined the Oxford and Bucks Light Infantry and became involved with concert parties for the troops. He had a record of ill health, which he was stationed in England during the war. In fact he suffered from bronchitis for the rest of his life, but managed to disguise the fact. He did not turn professional after the war, due to the fact of his responsibilities to his growing family, and found work with a company selling hairdressing equipment. Once his 2 sons, Peter and Keith finished schooling, he decided to try his hand at professional acting. He started in radio, but then TV work started coming, such as David Copperfield, Z Cars and Dr Finlays Casebook. 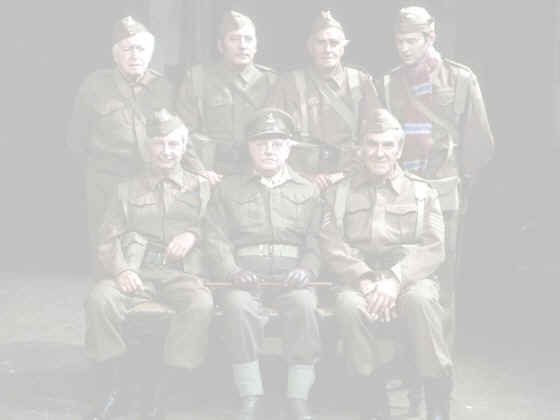 Dad's Army started in 1968, but Edward didn't appear until episode 5, "The Showing Up Of Corporal Jones", it wasn't until the fifth series that he became a regular and gradually he had a bigger part with each series produced and became the highlight of his career. Sadly, just after Dad's Army finished he and his wife Gladys had been holidaying in Bournemouth, and decided to visit their sons on the way home. On the last day of their stay, Edward went indoors to start packing, suffered a massive heart attack and collapsed on the floor. Edward's devotion to his family meant that he had a late start in his acting career, and his death cut this cruelly short. Who knows what he may have achieved?